Canada's national parks are treasures in a world that seems to be constantly under development. 47 examples of natural landscapes and phenomena are open to the public, yet protected by law "for public understanding, appreciation, and enjoyment, while being maintained in an unimpaired state for future generations." These North American national parks span every province and territory and include mountains and plains, boreal forests and tundra, lakes and glaciers, and more. 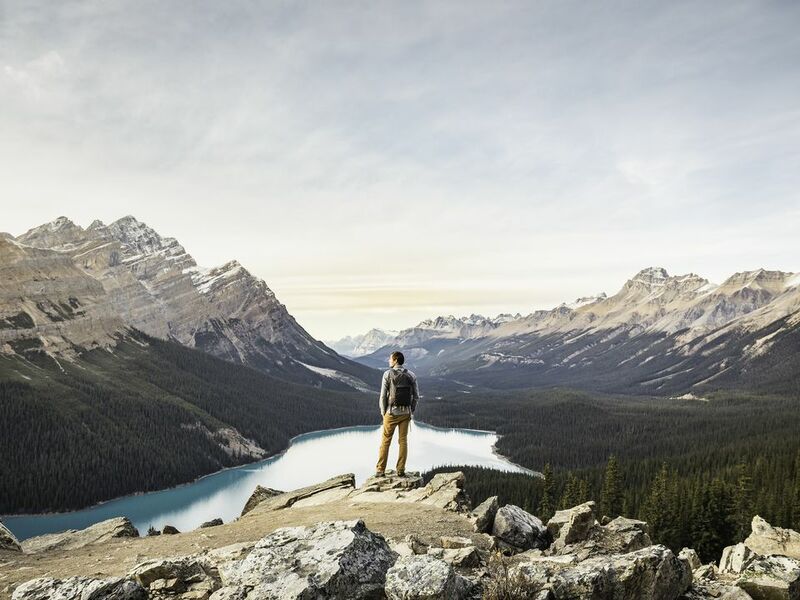 Canada's natural environment has molded the country's national identity and continues to be a source of enjoyment and pride for Canadians and visitors. British Columbia is Canada's most western province, bordering the Pacific Ocean on its west, Alaska, the Northwest Territories, and the Yukon to the north, Alberta on the east and Montana, Idaho and Washington to the south. B.C. 's landscape offers up mountains, rugged coastline, lakes, rainforest, and even desert. In addition to varied geography, B.C. is inhabited by a largely outdoor-loving, adventurous population who enjoy frequenting their parks. The national park system is complemented by an even larger number of B.C. provincial parks. Glacier National Park of Canada - Lush interior rainforest and permanent glaciers. Gulf Islands National Park Reserve of Canada - Exceptional coastal island landscape in the southern Strait of Georgia. Gwaii Haanas National Park Reserve and Haida Heritage Site - Haïda culture and coastal rainforest on the Queen Charlotte Islands. Kootenay National Park of Canada - UNESCO World Heritage Site featuring the famous Radium Hot Springs. Mount Revelstoke National Park of Canada - Rainforest of 1,000-year-old cedars and spectacular mountains. Yoho National Park of Canada - UNESCO World Heritage Site in the Rockies. Pacific Rim National Park Reserve of Canada - Pacific Coast Mountains make up this marine and forest environment. Some of Canada's most popular and beautiful national parks are in Alberta. The Rocky Mountain range provides the backdrop for three of them and all provide an opportunity for stunning wildlife viewing opportunities, camping, hiking and more. Banff National Park of Canada - UNESCO World Heritage Site and Canada's first National Park of Canada (1885). Elk Island National Park of Canada - Alberta plains oasis for rare and endangered species. Jasper National Park of Canada - UNESCO World Heritage Site and the glacial jewel of the Rockies. Waterton Lakes National Park of Canada – International Peace Park; where the Rocky Mountains meet the prairie. Wood Buffalo National Park of Canada – UNESCO World Heritage Site larger than Switzerland. Manitoba is one of Canada's prairie provinces, known for their flat grasslands and farmland. Manitoba has hundreds of lakes and even saltwater coastline. In addition to the following two national parks, Manitoba has dozens of provincial parks. Riding Mountain National Park of Canada - Protected "island" area in the Manitoba Escarpment. Wapusk National Park of Canada - One of the largest polar bear denning areas in the world. Grasslands National Park of Canada - Saskatchewan's rare prairie grasses, dinosaur fossils, and badlands. Prince Albert National Park of Canada - Protects slice of northern coniferous forest and wildlife. Bruce Peninsula National Park of Canada - Landscapes including the northern end of Niagara Escarpment. Georgian Bay Islands National Park of Canada – Islands on the edge of Lake Huron. Point Pelee National Park of Canada – Most southern point on the Canadian mainland. St. Lawrence Islands National Park of Canada – Established in 1904. Pukaskwa National Park of Canada - Canadian Shield's ancient landscape on Superior's North Shore. Forillon National Park of Canada – The "Jewel of the Gaspé" where land meets ​the sea. Mauricie National Park of Canada – Lakes winding through forested hills for canoe and portage activities. Mingan Archipelago National Park Reserve of Canada – A string of islands carved out by the sea. Fundy National Park of Canada – Atlantic's sanctuary with world's highest tides. Kouchibouguac National Park of Canada – Intricate Acadian blend of coastal and inland habitats. Cape Breton Highlands National Park of Canada – Home to Cabot Trail, a land blessed with spectacular cliffs. Kejimkujik National Park of Canada – Nova Scotia's inland of historic canoe routes and portages. Prince Edward Island National Park of Canada – A protected area with a spectacular coast. Terra Nova National Park of Canada – Remnants of the Eastern Newfoundland Ancient Appalachian Mountains. Torngat Mountains National Park Reserve of Canada – The spectacular wilderness of this National Park Reserve comprises 9,700 km2 of the Northern Labrador Mountains natural region. Gros Morne National Park of Canada – UNESCO World Heritage Site amid Newfoundland's wild natural beauty. Tuktut Nogait National Park of Canada – Calving ground for the Bluenose caribou herd. Nahanni National Park Reserve of Canada – Northwest Territories' UNESCO World Heritage Site. Aulavik National Park of Canada – Over 12,000 km2 of Arctic wilderness on Banks Island. Ivvavik National Park of Canada – Calving ground for the Porcupine caribou herd. Kluane National Park and Reserve of Canada – Yukon's UNESCO World Heritage Site contains Canada's highest peak. Vuntut National Park of Canada – Northern Yukon's unique non-glaciated landscape. Quttinirpaaq National Park of Canada – Most remote, fragile, rugged and northerly lands in North America. Sirmilik National Park of Canada – Northern Baffin Island landscape containing Eastern Arctic Lowlands and Lancaster Sound. Auyuittuq National Park of Canada – Baffin Island landscapes containing northern extremity of Canadian Shield. Ukkusiksalik National Park of Canada – The place where there is stone that can be used to carve pots and oil lamps. Canada is home to some of world's most wondrous natural attractions. You're Invited! 10 Ways to Celebrate Canada's 150th birthday.